It's always interesting when events in your life come full circle. When it happens, it often seems serendipitous but I often wonder if there's a bigger plan for all of us that we don't necessarily know about at first. Three years ago Joel and I were in Paris for a long weekend and we took the train to Champagne, about an hours ride east of the city. I had set up visits at four favorite 'Maison de Champagnes': Lanson, Billecart-Salmon, Pol Roger and Bruno Paillard. It was during the middle of a downpour when we arrived at Maison Bruno Paillard and Bruno's daughter Alice came out to greet us with a big smile and an umbrella for us to share as we headed into the very modern-looking winery. 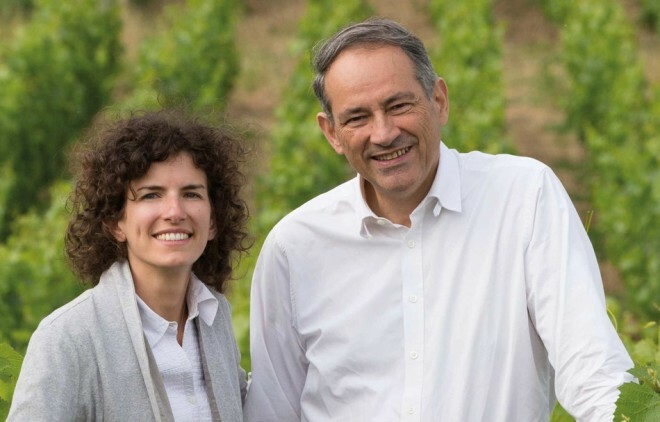 Alice Paillard in the vineyards with her father. Alice spent hours with us, explaining how their wine is made while showing us various maps of the region and the vineyards before giving a tour of the whole property, from where the grapes come in to where the wines age. We had worked up quite a thirst by the time she invited us to taste the wines! "Let me see if my father is here" she said and she left us alone in the tasting room, waiting patiently. In walked Bruno Paillard himself, looking as elegant and dapper as he does in photos. I was thrilled to meet the person whose name was on a bottle of Champagne that I frequently recommended to my customers. While we tasted through his wines, he told us about the vision he had when he was a young man to create pure and focused Champagnes. I remember thinking that this is a man who had accomplished his mission. The wines, with their tiny bubbles, are full of fresh fruit aromas and have a beautiful purity and elegance on the palate, leaving behind a clean and refreshing taste. As Bruno would say, his wines are "full of life". Three years later my "Champagne Bruno Paillard" story came full circle. Bruno was visiting New York City and I was able to interview him for my job at Grape Collective. It was now my turn to host this charming man. You never know where life will take you if you just put yourself out there — one adventure after the next in the circle of life! Read the full article and interview on GrapeCollective.com. Each year, Bruno comissions an artist to design the labels of his vintage champagne. He gives the artist one or two words which reflect the characteristics of that particular year as inspiration for the art. From my visit to Maison Bruno Paillard, "For Lisa, Our ambassador in NYC!" Reims, October 15, 2014. A vintage 2002 Bruno Paillard Blanc de Blancs.